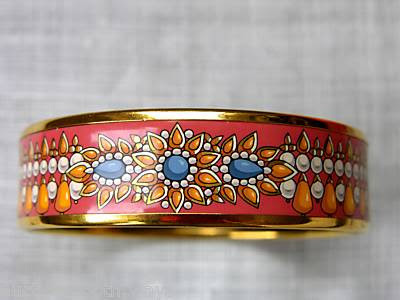 I've always loved enamel jewellery and now I'm collecting costume jewellery I was keen to get an enamel bangle. This Hermes one is currently on ebay-isn't it gorgeous!! But totally out of my price range!! I found this gorgeous enamel bangle for only £1.50 at the boot sale-its in gorgeous condition and the colours are perfect for summer too! What sort of bangles will you be in this summer? omg i love hermes, it looks fabulous darling! Ooh, your bangle is a work of art- what a great find! I have never been much of a bangle girl, but the 2 you have posted are really nice. None - I never find any small enough for my wrists! Your find looks fabulous. Plus I did a you on Saturday and went to all our local thrift shops - nothing for me but for 49p petit garcon got a Spiderman mobile phone with flip lid! yours is absolutely beautiful! I like them all colours this summer! U know i adores bangles. U showed two beautiful bangles and I die for... LOL! These are just gorgeous. Its funny I never seem to wear this kind of thing enough..its either too hot out or too cold. And its just steamy now. Ooh I love bangles, but I hate wearing them for some reason haha! Such beautiful bangles!!! Love them. sharon, i am thinking of a hermes bangle. gorgeous bangles, i really love the first one! I really need to start collecting more pieces of jewelry - great inspiration! The Hermes bangle is gorgeous. Hi everyone-thanks so much for all the fabulous comments, all so much appreciated! Sadly I rarely wear bangles as they get in the way when I write. 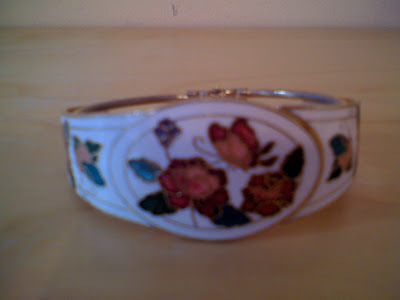 the enamelled bangle you scored is gorgeous! love how sumemry it feels, there is a gyspy feel to it too. I heart it! Thanks so much for your note. I sure hope its cooler there than here. Its just muggy and sweaty here. yay to enamel (and any other gregarious) costme jewellery! i saw the bangel that you cought in a flea market a while ago.. i almost bought it but the seller asked for too much money..
Hi ladies-thanks so much for the lovely comments!! While I like the Hermes enamel bangles, especially when groups of them are worn together, I think that your rose bangle is really sweet. It was and awesome buy! Amazing finds, darling! I am really smitten with that first bangle! I love bangles but they annoy me too much and always have to come off after a while. I prefer simple bangles. I love bangles, really cant get enough enemal bangles. 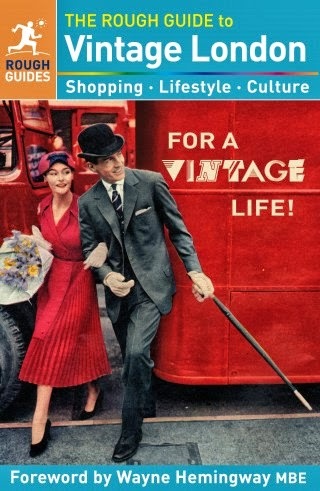 Although I love Hermes, yours is really a Great bargain! Hi everyone-such lovely comments, thanks to you all! Such a fantastic bangle! I love enamel jewelry. I'm hoping to find a perfect piece soon. I'm a total bangle girl, being from South Asia. ^__^ The trend in India now seems to be loads of skinny little metallic and colored bangles on one wrist to match the outfit worn, so I'm trying to do that whenever I go out. I think it's a fabulous look. 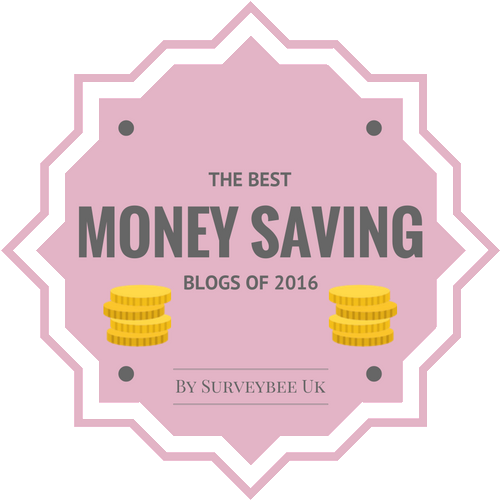 Hi Anusha-I agree, bangles are a lovely trend, I'm going to try and thrift some more!! Sharon, if you haven't already you should check out all the fab Indian stores you have in London. Most Indian and Pakistani stores sell cheap, colored bangles in either metal or plastic that look really, really pretty. I wish we had more Indian stores here. Nothing quite like bangles from that part of the world. Hi Anusha-fabulous idea, I have a lot locally too, thanks!! Oh no you di'int!!!! That Hermes is making me seeeeeeeethe with envy, and that's not good for my image! Hi Karen-mine isn't Hermes, more's the pity,LOL! !